Raining Animals - Weird But True !!!! | Do You Know? 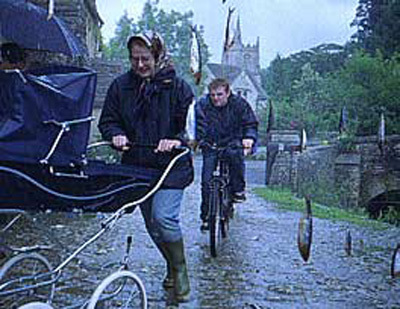 Raining Animals - Weird But True !!!! Raining animals is a rare meteorological phenomenon in which flightless animals "rain" from the sky. 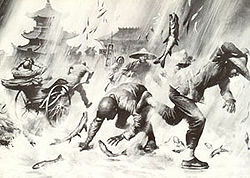 Such occurrences have been reported from many countries throughout history. One hypothesis offered to explain this phenomenon is that strong winds traveling over water sometimes pick up creatures such as fish or frogs, and carry them for up to several miles. However, this primary aspect of the phenomenon has never been witnessed or scientifically tested. 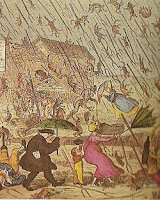 English cartoons Illustrating Animal Rain !!! Sometimes the animals survive the fall, In some incidents, however, the animals are frozen to death or even completely encased in ice. Some cases occur just after storms having strong winds, especially during tornadoes. Raining spiders in Brazil, Feb 2013 !! Worms dropped from the sky in Jennings, Louisiana, on July 11, 2007. Spiders fell from the sky in Salta Province, Argentina on April 6, 2007. Orange eggs of an unknown species of invertebrate rained down on the Alaskan city of Kivalina on August 4, 2011. 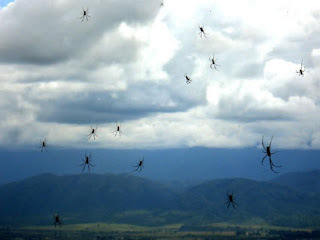 Spiders fell from rain in Brazil in Feb 2013.